Cute things come in small packages. 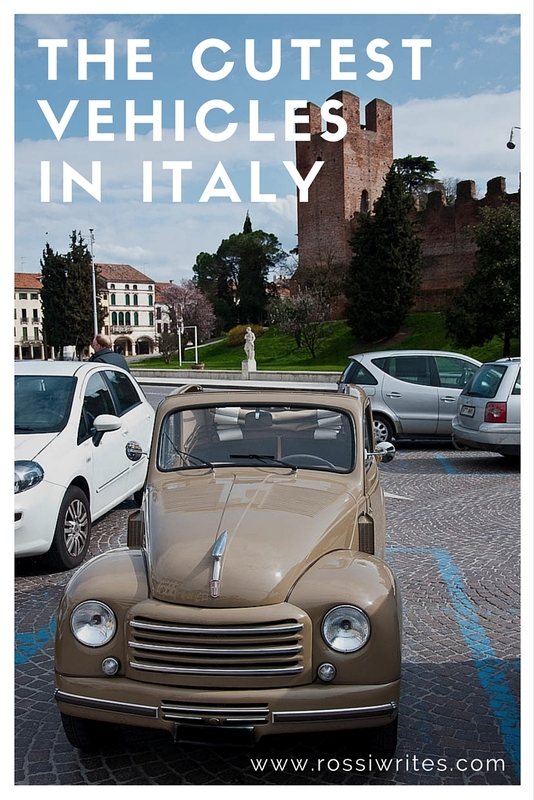 Never has a truer word been spoken about the type of cars, mopeds and even buses which you can see in Italy’s cities and villages. Unbelievable, isn’t it?! 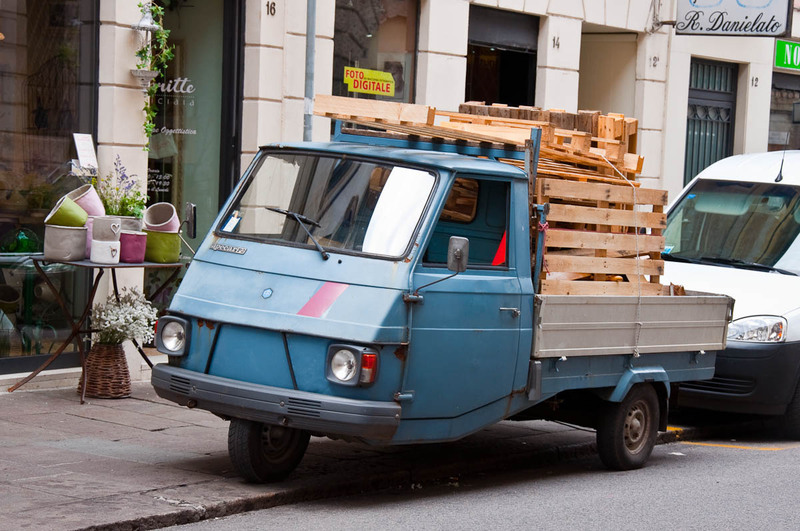 Considering that some of these vehicles only come up to your armpit and seem to precariously balance on three wheels. But they not only move, they are also used to transport goods and people from one point to another. And even to deliver mail on a daily basis. 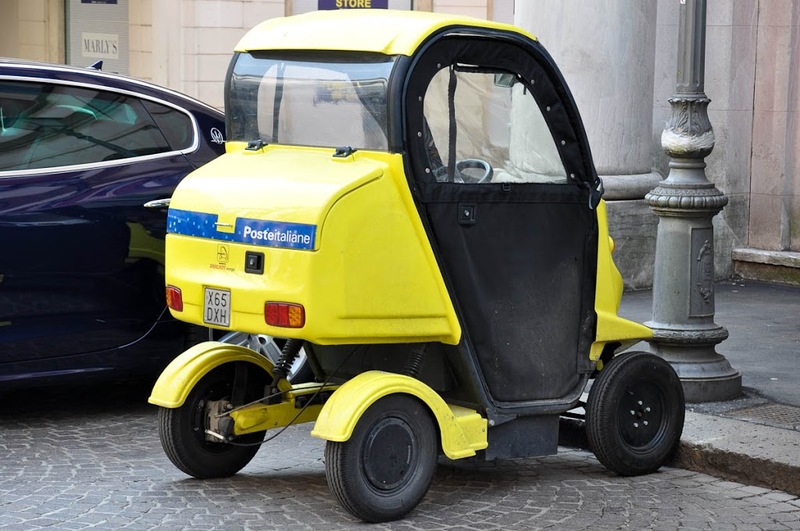 Yes, this is one of the Italian Postal Services’ tricycles. 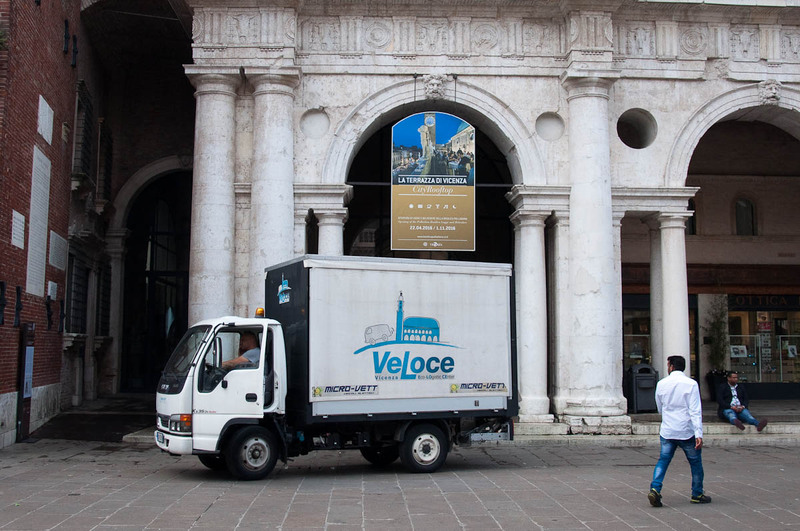 I often see it rolling down Corso Palladio – Vicenza’s high street – stuffed to the brim with letters and packages. 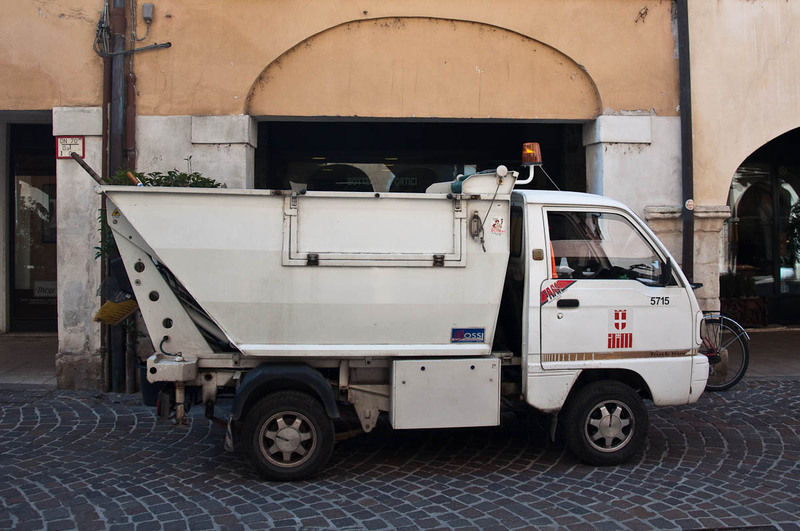 So, without further ado let me show you some of the cutest vehicles on the streets of Italy which add yet another touch of exuberance to living here. Who can forget the first time they have laid eyes on the cutest car alive?! 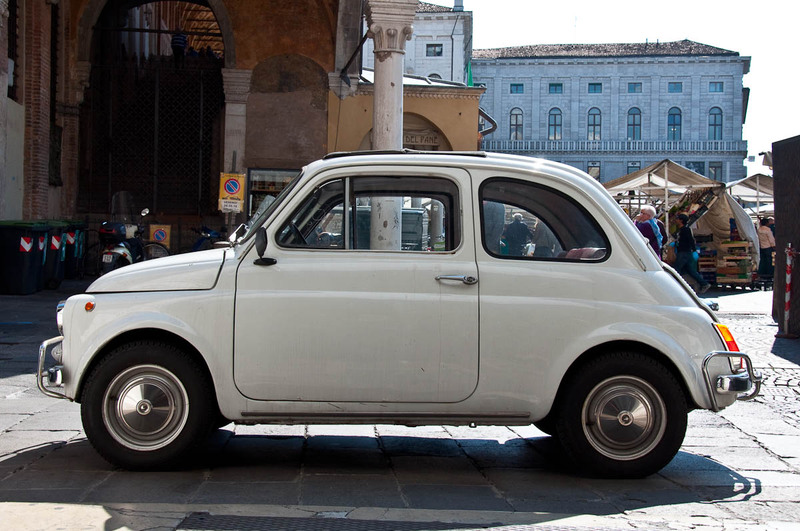 I remember seeing my very first Fiat 500 straight after we moved to Italy. It was so quaint and so wonderful, I have been on the lookout to see more and more of them ever since. So, it was with some glee that I discovered that a neighbour of ours actually drives one. Lips never been touched by a smile, she looks almost regal sitting in the little thing. 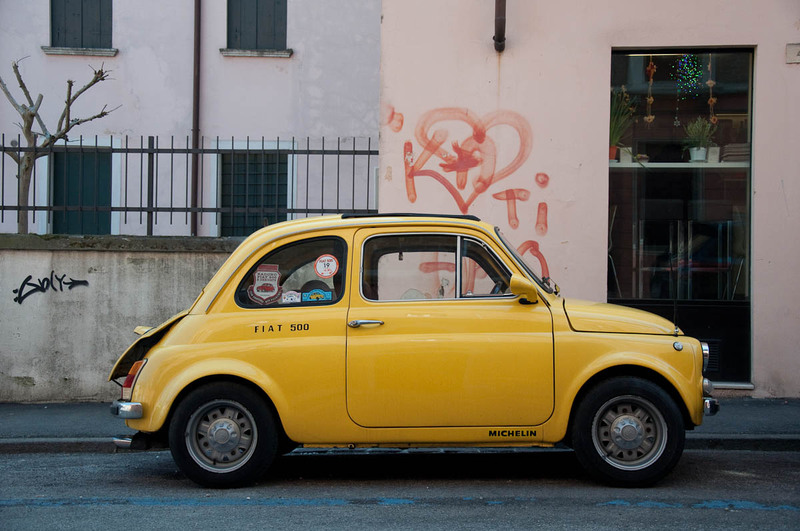 And when I hear the unmistakable loud exhaust sound, I know it’s her, so I furtively glance through the window to admire the little car and get a portion of Italian life just as you see it on the silver screen. 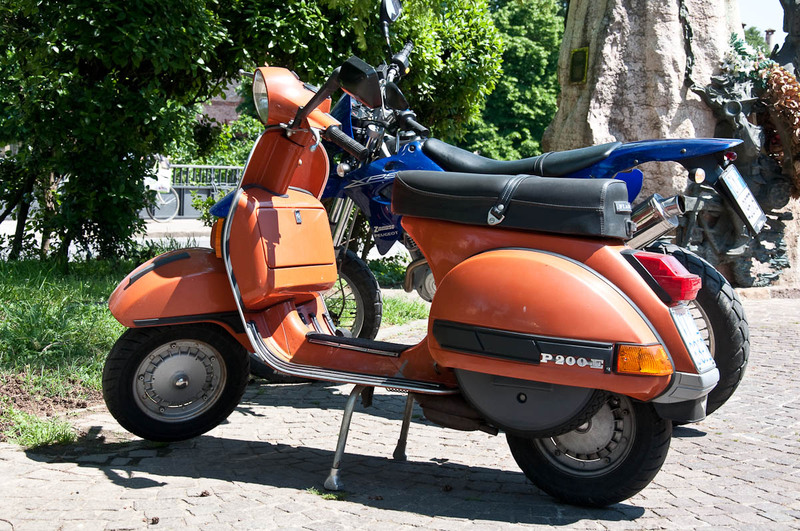 Now, obviously, I wouldn’t be photographing my neighbours’ cars, so instead, I snapped the above two cuties on the streets of Vicenza and Padua. 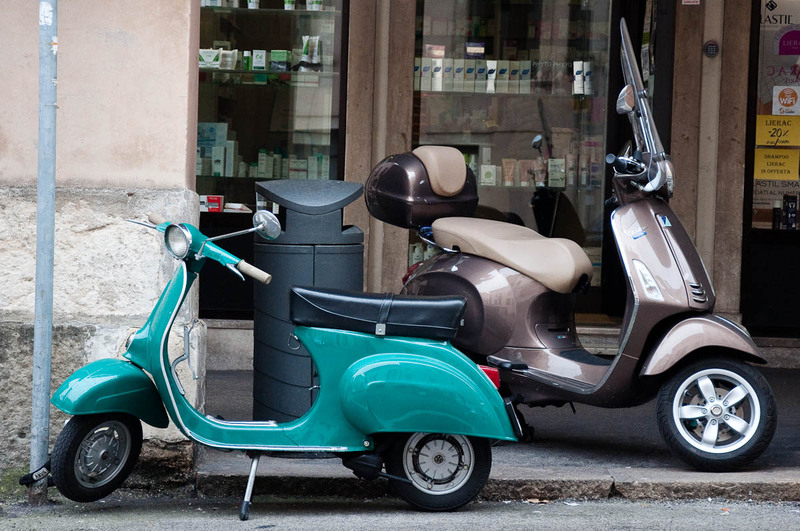 It wouldn’t be Italy without a large assortment of scooters and mopeds zipping up and down its curving historical streets. And we have our fair share of them here in Vicenza. The ones which always draw my eyes though are the old-fashioned tiny little things on wheels which seem to be dwarfed by their contemporary brothers. I am secretly in love with the teal-y one in the first picture above. I have been wanting to take a proper photo of it for a long time, but every time I see it on the street, it has been parked right next to a rubbish bin. 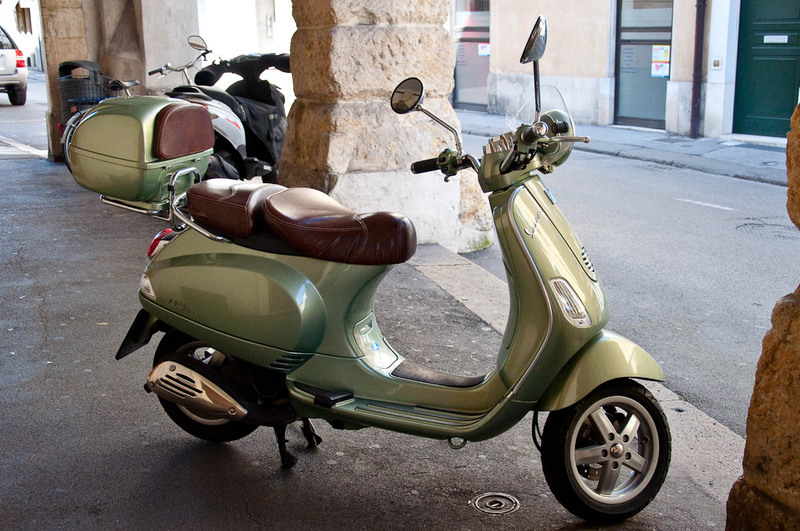 At least, the modern scooter next to it is great for scale, as it shows you how really really tiny it is. I was walking up a narrow curving street in the historical heart of Vicenza. 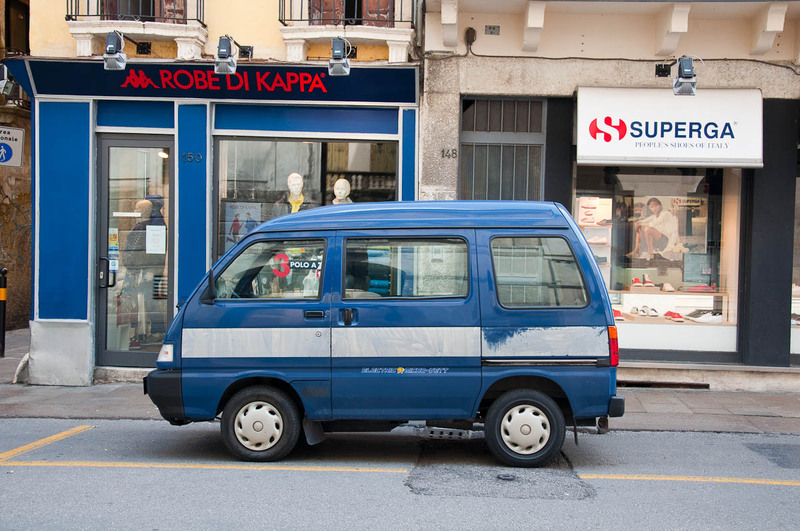 The type which is lined up with palazzi built centuries ago and where the pavement is only on one side of the street and it is just a bit wider than your shoulders. All of a sudden there was a rumbling roaring sound telling me that a powerful vehicle was coming behind me. I flattened myself against the wall and then I saw it. 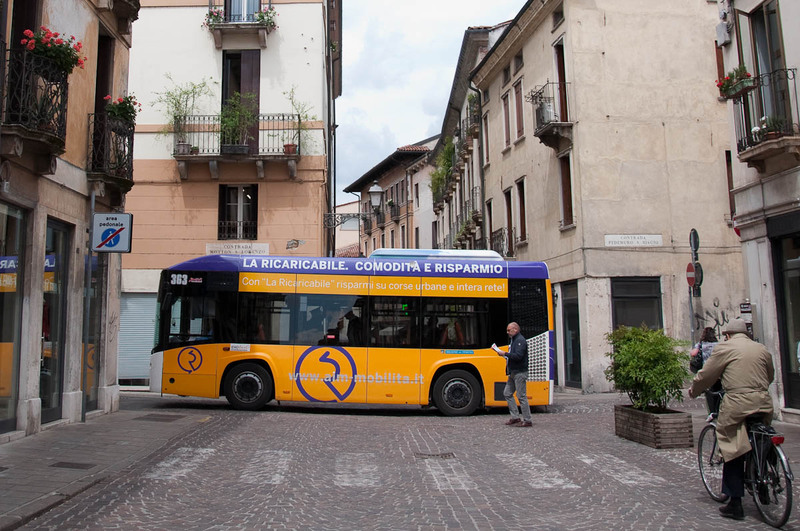 I baby-size bus, downscaled and streamlined to fit the narrow medieval streets of Italy. Unbelievably cute! 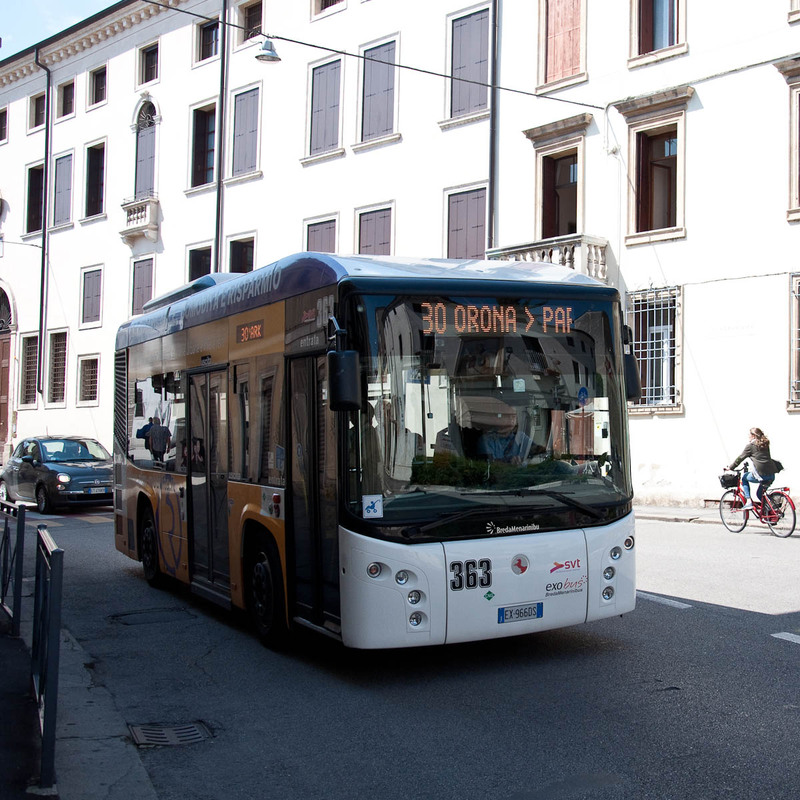 Obviously there are full-size buses in Vicenza, too and it is always great seeing them right next to the little ones serving the routes in the historical centre of the city. Yes, they have also been downsized so that they can squeeze through old towns with a labyrinth of tiny curving streets. In a way they look like a rubbish container on wheels but way cuter. You can often see them zipping back and forth across town. They look just like a proper box van save for their size, which is minuscule. Well, you need to be tiny in order to negotiate narrow stone-paved streets which curve at unexpected angles and where two modern-sized vehicles would create an epic congestion. At the same time, deliveries have to be made, small restaurants and eateries, cuddled in the historical centre, need their fresh supplies in on a daily basis, and people move in and out of old buildings and can’t carry it all by hand. So, these delivery vehicles, fun-sized that they are, come in very handy indeed. 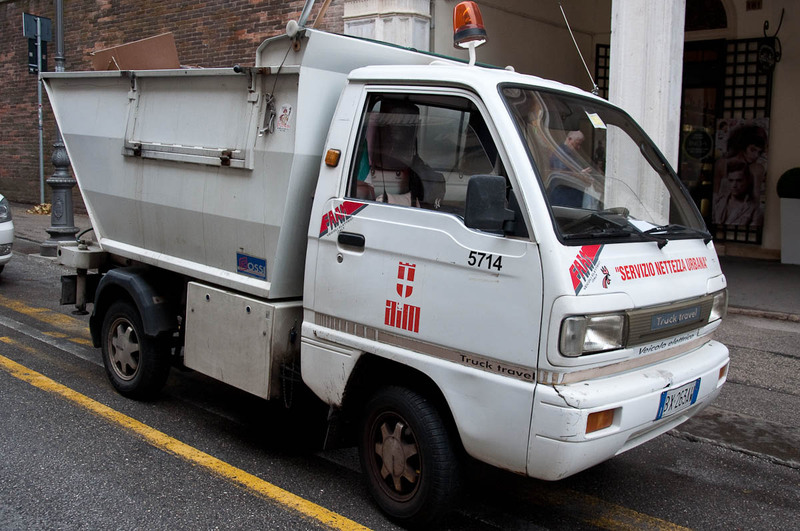 Let me finish this fun list with one of the most iconic in terms of cuteness vehicles of them all – the legendary Ape 50. I remember seeing my very first one several years ago on a visit to San Gimignano in Tuscany. Honestly, the famed towers of the medieval Manhattan couldn’t quite measure up to the attraction factor of that little car. Did I say ‘car’? It is more like a tricycle, isn’t it?! But a covered one. 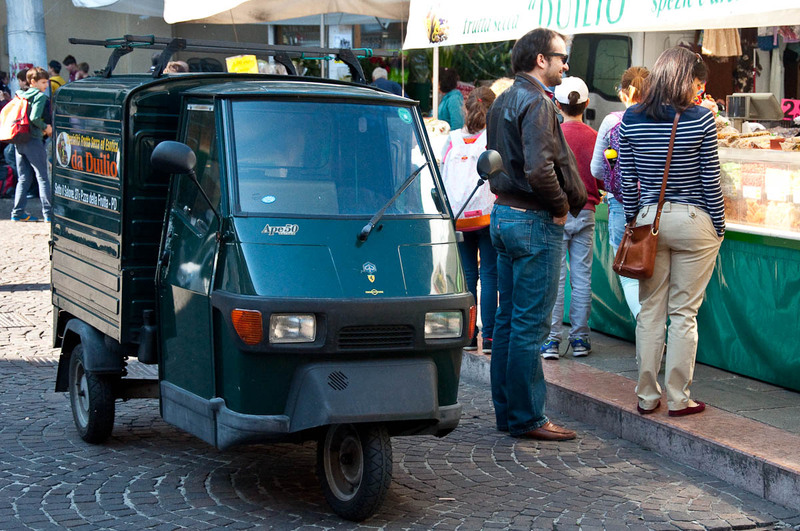 I love seeing a tiny Ape 50 zipping up and down the road completely in line with its name which means ‘bee’ in Italian. 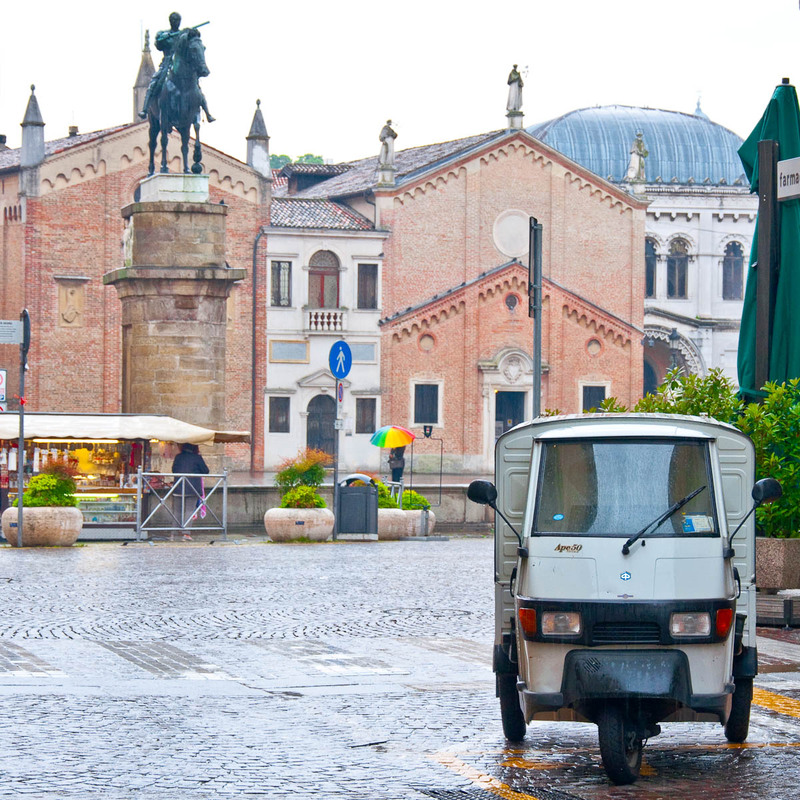 And if you are desperate to see one (and, obviously, have your picture taken with it), go to Padua’s 800-years old market, where there seems to be a never-ending stream of Ape 50. I remember, I few years ago, Ape 50 converted into coffee bars started to appear on the streets of London and they became quite the thing. People would even hire them for events and festivals. It just felt so cute to have a cup of proper Italian coffee served from the back of an iconic Italian vehicle. 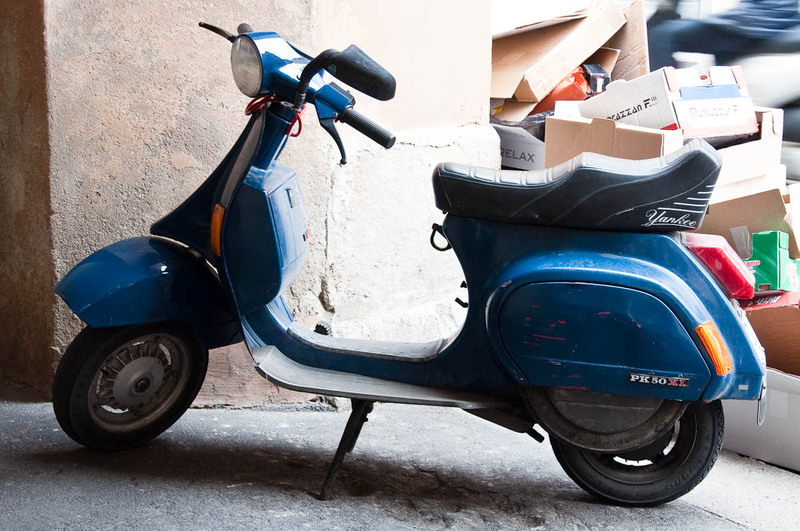 I hope you enjoyed this little review of totally cute tiny Italian cars, mopeds and other vehicles. Have you ridden any of these? And which one stole your heart? Let me know!